In the beautiful scenery of Valle d'Itria, about 2 km. from the town of Cisternino and a few kilometers from the sea, there is 'Trullo Saettone', a stone structure composed of a trullo and a lamia, lost among the centuries-old olive trees and immersed in uncontaminated nature, among holm oak and oak trees, arbutus trees , lavender and rosemary and other plants of the Mediterranean scrub, rural sheep tracks to be traveled by bicycle or on foot, specchie and stone walls in stone. Recently restored and furnished with care, the owner has cleverly created, around the central cone of the trullo, used as a living room, some rooms for kitchen, bedroom, bathroom and closet; the small lamia, near the trullo, in the past used for the shelter of animals of the low court, has a bedroom, bathroom and a cooking area. 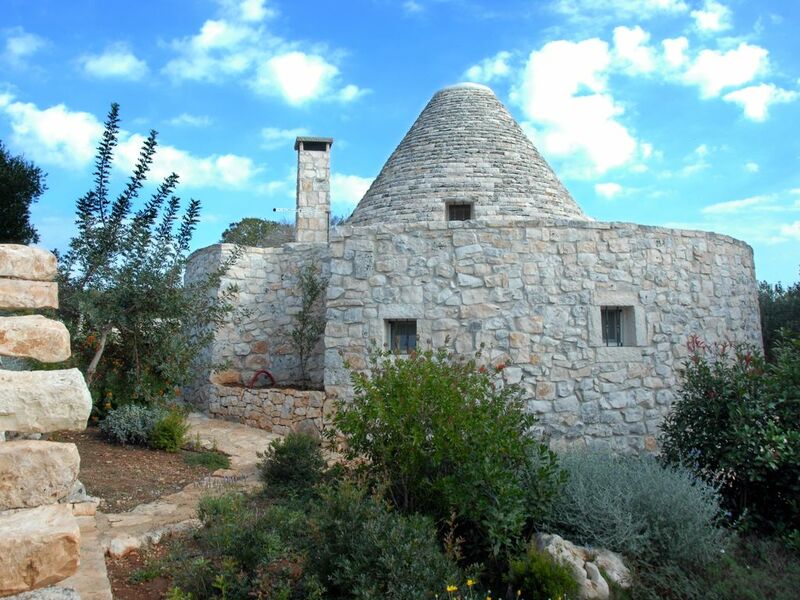 The whole structure - trullo and lamia - can comfortably accommodate up to 5 people. The property is leased pursuant to art. 4 of the D. L. 24. 04. 2017, n. 50, converted, with amendments, into Law 21. 06. 2017, n. 96, with the application of tax regulations for the so-called "short leases" or contracts for leases for residential use not exceeding thirty days each, aimed at satisfying transient housing needs also for tourism purposes, with the supply of bed linen and baths, the cleaning of the premises, the possible use of wi-fi and telephone utilities, outside the exercise of the business activity, directly or through subjects who carry out the activity of real estate brokerage or subjects that they manage telematic portals putting people in search of a property in contact with people who have real estate units to be rented. Upon arrival at The welcome basket of local products. Civil liability insurance policy. From 'Trullo Saettone' you can make day trips in the 'White City' of Ostuni (14 km), the trulli of Alberobello (20 km), in Martina Franca with its Baroque (10 km), the Caves of Castellana (30 km ), Fasano with its rock dwellings, Egnathia and Zoo Safari, ideal for children; as well as easy access to the beaches of Torre Canne, the Pylon and Rosa Marina, with sand dunes and cliffs and coves in the Natural Park of Torre Guaceto. Do not miss the city of Taranto with the Archaeological Museum and the city of Lecce with its historic Baroque. At night, grab a jump in the old town of Cisternino with the typical Mediterranean architecture, the typical local butchers and restaurants where you can taste local beef to the stove, accompanied by good wine and live music.